Lofgren KA and Kenny PA (2016) An instructive ductal microenvironment is key for efficient in vivo modeling of estrogen receptor positive breast cancer. Translational Cancer Research 5:S2:S360-362 [PDF]. Azimi I, Beilby H, Davis FM, Marcial DL, Kenny PA, Thompson EW, Roberts-Thomson SJ & Monteith GR (2016) Altered purinergic receptor-Ca2+ signaling associated with hypoxia-induced epithelial-mesenchymal transition in breast cancer cells. Molecular Oncology 10(1):166-178 [PDF]. Peterson EA, Jenkins EC, Lofgren KA, Chandiramani N, Liu H, Aranda E, Barnett M, Kenny PA (2015) Amphiregulin is a critical downstream effector of estrogen signaling in ERα-positive breast cancer. 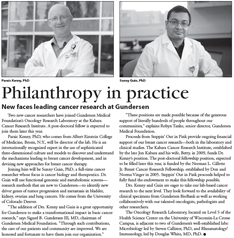 Cancer Research 75(22):4830-4838 [PDF]. Chandiramani N and Kenny PA (2014) Comparative analysis of GATA3 mutation profiles between Asian and Western breast cancer patients: Is there really a difference? Cancer 120(17)2778-2779 [PDF]. Zhou ZN, Sharma VP, Beaty, BP, Roh-Johnson M, Peterson EA, Van Rooijen N, Kenny PA, Wiley HS, Condeelis JS and Segall JE (2014) Autocrine HBEGF expression promotes breast cancer intravasation, metastasis and macrophage-independent invasion in vivo. Oncogene 33(29):3784-3793 [PDF] [Cited by 5]. So PL, Wang GY, Wang K, Chuang M, Chiueh VC, Kenny PA and Epstein EH (2014) PI3K-Akt signaling is a downstream effector of retinoid prevention of murine basal cell carcinogenesis. Cancer Prevention Research 7(4):407-17 [PDF]. Peterson EA, Pectasides E, Shabbeer S, Wiechmann L, Sparano JA & Kenny PA. (2013) Evaluation of serum Amphiregulin levels in breast cancer patients and cancer-free controls. Experimental Hematology & Oncology 2(1):25 [PDF]. Miwa HE, Koba WR, Fine EJ, Giricz O, Kenny PA & Stanley P. (2013) Bisected, complex N-glycans and galectins in mouse mammary tumor progression and human breast cancer. Glycobiology 23(12):1477-1490 [PDF] [Cited by 2]. Giricz O, Calvo V, Peterson EA, Abouzeid CM and Kenny PA (2013) TACE-dependent TGF-alpha shedding drives triple-negative breast cancer cell invasion. International Journal of Cancer 133:2587-2595 [PDF] [Cited by 2]. Bhagat TD, Zhou L, Sokol L, Caceres G, Gundabolu K, Gordon S, Mantzaris I, Gligich O, Yu Y, Bhattacharyya S, Jing X, Polineni R, Tamari R, Bhatia K, Pellagatti A, Boultwood J, Kambhampati K, Steidl U, Stein C, Ju W, Liu G, Kenny PA, List A, Bitzer M and Verma A. (2013) miR-21 mediates hematopoietic suppression in MDS by activating TGF-b signaling. Blood 121(15):2875-81. [PDF] [Cited by 18]. Sparano JA, Ostrer H and Kenny PA (2013) Translating genomic research into clinical practice: Promises and pitfalls. ASCO Educational Book 15-23 [PDF]. Levano KS and Kenny PA (2012) Clarification of the C-terminal proteolytic processing site of human Amphiregulin. FEBS Letters 586(19):3500-2. [PDF] [Cited by 2]. Peterson EA, Shabbeer S and Kenny PA (2012) Normal range of serum Amphiregulin in healthy adult human females. Clin Biochem 43:460-463 [PDF] [Cited by 2]. Giricz O, Calvo V, Pero SC, Krag DN, Sparano JA and Kenny PA. (2012) GRB7 is required for triple-negative breast cancer cell invasion and survival. Breast Cancer Research and Treatment 133:607-615 [PDF] [Cited by 17]. Patsialou A, Wang Y, Lin J, Whitney K, Goswami S, Kenny PA and Condeelis JS. (2012). Selective gene expression profiling of migratory tumor cells in vivo predicts clinical outcome in breast cancer patients. Breast Cancer Research 14(5):139 [PDF] [Cited by 20]. Falconer C, Kenny PA, Smart CE, Monteith GR, Roberts-Thomson S (2012) Peroxisome proliferator-activated receptor subtypes in mammary gland development and breast cancer. 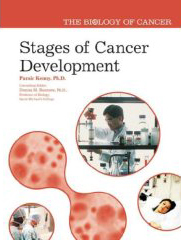 J Cancer Therapeutics & Research 1:14 [PDF] [Cited by 1]. Sparano JA, Goldstein LJ, Childs BH, Shak S, Brassard D, Badve S, Baehner FL, Bugarini R, Rowley S, Perez EA, Shulman LN, Martino S, Davidson NE, Kenny PA, Sledge GW and Gray R . (2011) Relationship between quantitative GRB7 RNA expression and recurrence after adjuvant anthracycline chemotherapy in triple negative breast cancer. Clinical Cancer Research 17(22):7194-7203 [PDF] [Cited by 5]. Loudig O, Brandwein-Gensler M, Kim R, Lin J, Isayeva T, Segall JE, Kenny PA and Prystowsky MB (2011) Illumina Whole-Genome DASL Platform: Assessing Its Performance in Formalin-Fixed Paraffin-Embedded Samples and Its Applicability for Identification of Invasion-Related Genes in Aggressive Oral Squamous Cell Carcinoma. Human Pathology 42(12):1911-22 [PDF] [Cited by 13]. Davis FM, Kenny PA, Soo ETL, van Denderen BJW, Thomson EW, Cabot PJ, Parat MO, Roberts-Thomson SJ and Monteith GR. (2011) Remodeling of Purinergic Receptor-Mediated Ca2+ Signaling as a Consequence of EGF-Induced Epithelial-Mesenchymal Transition in Breast Cancer Cells. PLOS One 6(8): e23464 [PDF] [Cited by 18]. Read the review of this book from the National Science Teachers Association. 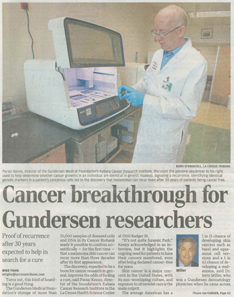 Article on Paraic's receipt of Eastern Cooperative Oncology Group Translational Research Award in Oncology Times. Our collaborative work on ORAI1/SPCA2 published in Cell (2010) has been highlighted in Nature Reviews Cancer. 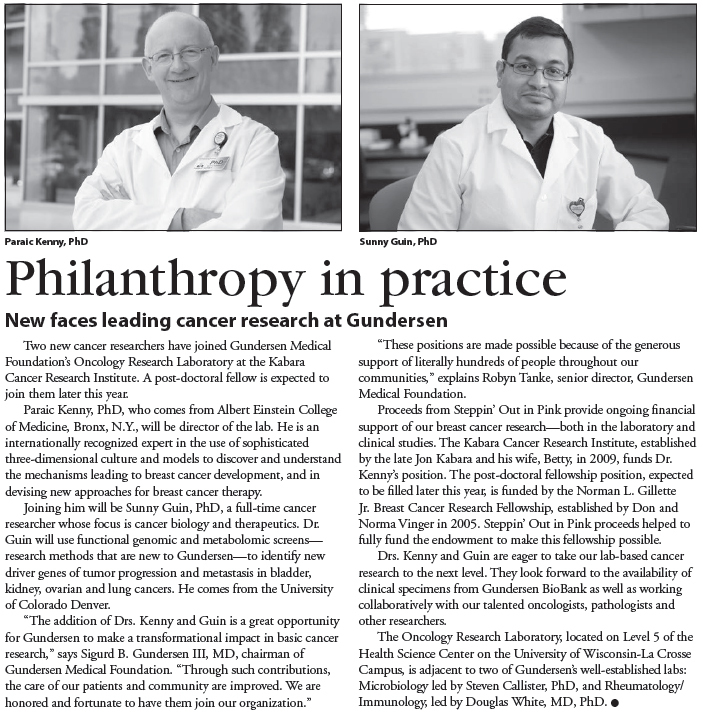 Kenny lab featured in Gundersen's Bridges newsletter.